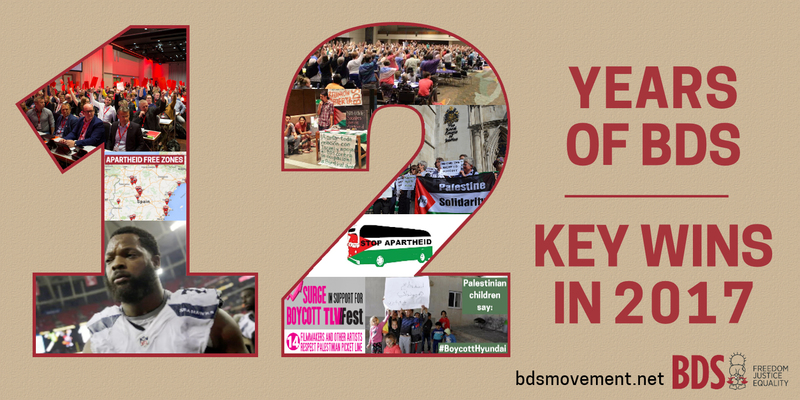 As BDS turns 12 this week, here are 12 indicators of our movement’s growing impact from 2017 to mark the occasion. July 9, 2017 marks 12 years since the Boycott, Divestment and Sanctions (BDS) movement was born. It’s been 12 years since an impressively large and diverse coalition across Palestinian civil society surmounted incredible odds to unify around three basic Palestinian rights and a nonviolent, inclusive, anti-racist path of struggle to achieve them. Despite the fragmentation, military occupation, segregation and dispossession, we came together to assert our people’s right to freedom, justice, equality and dignity. The 2005 BDS Call embodies overwhelming Palestinian support for demanding an end to Israel’s military occupation and the dismantling of its illegal wall, an end to its institutionalized and legalized system of racial discrimination which meets the UN definition of apartheid, and the right of refugees to return to their homeland as stipulated in international law. Inspired by the South African anti-apartheid movement and the American Civil Rights Movement, entities representing Palestinians everywhere called on people of conscience worldwide to adopt pressure tactics in support of our struggle for rights. BDS calls for boycott and divestment initiatives in the academic, cultural, economic and sports fields and for pressuring states to implement meaningful sanctions against Israel until it fully complies with its obligations under international law. You have not let us down. A UN report established that Israel has imposed a system of apartheid on the entire Palestinian people and called for BDS measures to end this apartheid regime. The Mennonite Church USA just voted by a 98% majority to divest from companies that profit from the Israeli occupation, following several mainline churches that have adopted similar policies in recent years, including the Presbyterian Church USA, the United Church of Christ and the United Methodist Church. The Mennonite resolution also urges church members to boycott products produced in illegal Israeli settlements built on stolen Palestinian land. Right to Boycott wins: The Spanish parliament affirmed that the right to advocate for Palestinian rights through BDS is protected under freedom of speech and association. The UK government was defeated in court by the Palestine Solidarity Campaign and its allies in a ruling that deems it unlawful for the government to restrict the right of local authorities to divest from companies complicit in Israel’s violations of Palestinian human rights. The Swiss parliament blocked Israel lobby efforts to criminalize support for BDS. Norway’s largest trade union federation, representing close to one million workers, endorsed a full boycott of Israel to achieve Palestinian rights under international law. The Lebanese doctors’ syndicate dropped G4S, the world’s largest private security company, following a campaign by boycott activists in Lebanon concerned with the company’s ongoing complicity in Israeli violations of Palestinian human rights. G4S also suffered its first loss in Ecuador, where a research institute dropped its contract with the company following a BDS campaign. A California transportation board dropped its contract with G4S after a human rights and labor coalition, including BDS activists, highlighted the company’s role in violating human rights in Palestine and the United States. These developments follow many BDS successes in previous years against G4S in Jordan, Colombia, Finland, UK, South Africa, the European Parliament, among other countries and institutions, which compelled the company to sell most of its illegal Israeli operations. Israel’s largest public transportation operator lost a 190 million euro contract to run public transportation in the Netherlands. A Palestinian coalition of Christian organizations called on the World Council of Churches to support the BDS movement for Palestinian human rights. A wave of boycotts hit the Tel Aviv International LGBT Film Festival as artists from around the world showed respect for the Palestinian cultural boycott picket line. An award-winning South African filmmaker, whose film was scheduled to be the festival’s opening film, was among the artists who canceled their participation in the festival. Two Chilean universities cancelled events sponsored by the Israeli embassy, and students governments in several US and other universities passed various BDS measures. The Israeli government suffered an embarrassing blow after six out of eleven National Football League (NFL) players in the US turned down an all-expenses paid propaganda trip organized to improve Israel’s fast deteriorating image. BDS campaigns grow among Palestinian citizens of Israel. In coordination with BDS partners in South Korea, the BDS Committee of Palestinian Citizens of Israel (BDS48) launched a campaign to boycott and divest from Hyundai Heavy Industries (HHI) until the company ends its complicity in Israel’s violations of Palestinian human rights, particularly in Jerusalem and the Naqab (Negev).